Patanjali’s Yoga Sutra, one of the foundational texts of yoga philosophy, begins with the verse atha yoga anushasanam, which means “now the yoga is given or shared.” The first word of the verse—atha—reminds us that our yoga practice is about what we are doing and thinking right now. The verse implies that we are to commit to a practice and to bring that practice into our daily lives and relationships, in real time. So even though we live in the 21st century, we can apply this ancient wisdom today. As Patanjali writes, all that matters is that we begin here and now to live and practice with greater self-awareness and presence. The word sutra, which translates to “strand or thread,” refers to a series of teachings that are threaded together like pearls on a necklace. Patanjali’s Sutra is a collection of 196 short, pithy verses. While there is academic debate about the exact date Patanjali wrote his Sutra, it is approximately 2,000 years old, but its wisdom is timeless, and it continues to speak to the human mind and heart through the ages. Patanjali’s verses offer a time-tested “roadmap” of human consciousness and how to live a happy and meaningful life through the practice of yoga. Handouts are included in the tuition. 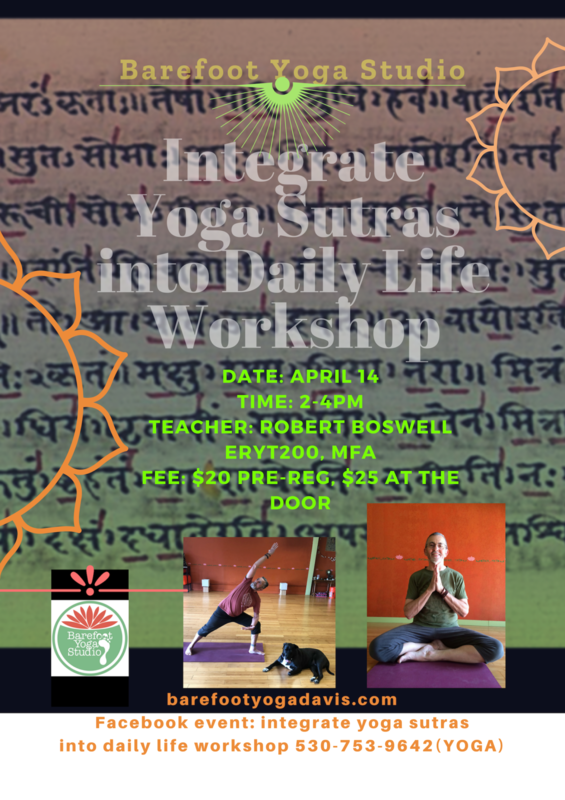 Robert Boswell MFA, ERYT200 is the founder, co-owner and lead teacher of Barefoot Yoga Studio in Davis. He teaches daily classes in Barefoot including Vinyasa, Yin, Restorative Yoga. He is the lead teacher for Philosophy Studies of 200 hours Yoga Teacher Training Course both in Davis and in Hong Kong.